Now that it's 2019, we�re going to start the new year here at Peak Prosperity by responding to the wishes of our premium subscribers and making our most recent premium report free to everyone. Because of this, the individual and collective choices we make today take on ever-increasing importance. Our collective choices -- around such issues as rampant money-printing by central banks, the failure to wean ourselves off of fossil fuels, and tossing an entire younger generation under the bus because that�s most convenient for an older generation afraid of living within its actual means -- are all pointing to a diminshed and disappointing future. We need to make better choices that align ourselves with these (and many other) looming realities. For ten long years, the world�s central banks have dragged everyone along for one last attempt at scaling Mount Credit. And here we are again in 2019, warning everyone of the same risks. Starting back in August of 2018 we were questioning whether �it� had arrived and then were declaring that it had throughout October and November. 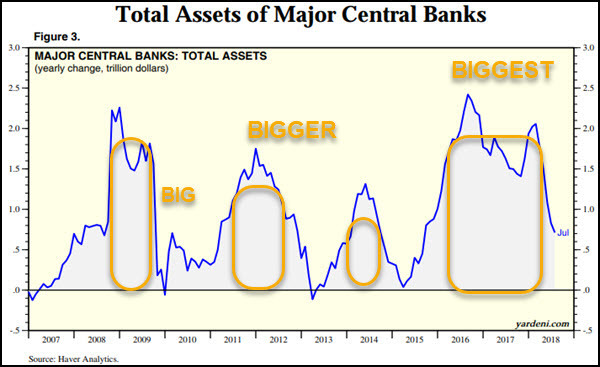 �Until and unless� the central banks reverse course 2019 will see even more of the same. More stock market volatility, more bond losses, and falling real estate. Eventually these credit stresses will impact those portions of the economy dependent on continued access to more dumb money. Eventually all the of the highly leveraged trading strategies have to pack up shop and go home and that�s when we discover that these �markets� are as fake as a spray on sun tan. No actual liquidity, only the appearance of such as temporarily afforded by all the computer algos out there. Behind the broad, swift market slide of 2018 is an underlying new reality: Roughly 85% of all trading is on autopilot�controlled by machines, models, or passive investing formulas, creating an unprecedented trading herd that moves in unison and is blazingly fast. �Electronic traders are wreaking havoc in the markets,� says Leon Cooperman, the billionaire stock picker who founded hedge fund Omega Advisors. Behind the models employed by quants are algorithms, or investment recipes, that automatically buy and sell based on pre-set inputs. Lately, they�re dumping stocks, traders and investors say. That�s funny! 10 years of steadily rising �markets" driven by these algos and the WSJ was entirely unconcerned. Now that stocks have been shown to also go down, suddenly the impact of these algos is very concerning to the WSJ. No worries as long as these programs are whipping prices higher, but a lot of concern when they amplify the moves down. Our concerns about �markets� so dominated by trading programs are that they are too easily subject to (1) manipulation and (2) sharp sudden movements that could, someday, result in markets being shut down due to lack of participation because the algos found conditions �out of parameter� and they up and left in the literal blink of an eye. And it�s the perfectly natural and expected outcome of too many years of increasing central bank intervention aimed at preventing the very thing we now face. That�s easy. Until and unless the central banks reverse course, once again, and make the next round of QE even larger and more bigly than any previously, we�ll see lots of declines in financial asset prices. Only this time? It won�t be constrained to falling stocks � it will envelop everything. Crass, and vulgar, and utterly indefensible. That�s the only way to describe the combined �leadership� of Ben Bernanke and Janet Yellen who conspired to throw an entire generation under the bus, along with the elderly on fixed incomes and savers too. Instead of noting that the 2001 � 2007 housing bubble was a very bad idea, the Fed printed up $1.75 trillion of fresh money to buy mortgage paper and help drive house prices right back up towards their silly, ill-advised peak. Houses, over the long term, should appreciate in line with inflation, no more no less. Anything above that green box means house prices have gotten ahead of themselves, and below means they�ve fallen too far. The idea here was morally bankrupt as it was illogical. The Fed thought that people living in houses with rising prices would experience a �wealth effect� and therefore both borrow and spend more, which would somehow be a good thing. Only in stupid-banker land does a liability that drains more cash from your pocket count as an asset. As Robert Kiyosaki has stressed in every lecture he�s given over the past 25 years, the house you live in is not an asset. Roofs need replacing, electricity and oil are consumed, painting and mowing and plowing are all part of simply preventing this thing from rotting straight away into the ground. Mortgage interest, insurance and property taxes have to be paid or you will quickly lose �your� house to some authority or another. Hence, Robert Kiyosaki is right; the house you live in is a liability, not an asset. How does someone become richer if they borrow more against their money pit? 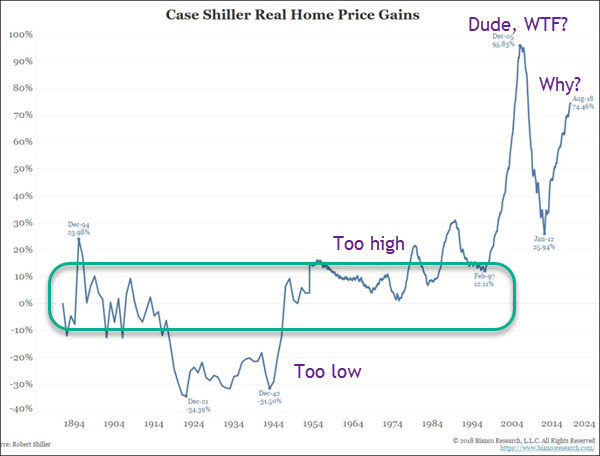 Well, that�s the entire centerpiece of the Fed�s decision to drive house prices up. It makes you richer. That�s their whole plan, laid bare. Now a cash flowing rental property, either residential or commercial, is another matter entirely. Those are assets. Lever up for those! Borrow away. We�ll be holding a Real Estate investing webinar in January so keep an eye out for that and be sure to sign up. The immoral part of the Fed�s decision to drive up house prices has two parts. The smaller part concerns the immorality of encouraging people to go deeper into debt (refi�s, HELOCS, etc.) by leveraging a liability. Bankers not should but do know better. The larger part centers on forcing an entire generation (e.g. Millennials) to either skip buying a house because they can�t afford one, or to buy a more expensive house than they can reasonably or comfortable afford. Put simply, the Fed threw an entire generation under the housing bus just so that the older folks could feel a little better about the price of their already purchased and lived-in home and maybe spend a little more. It�s no different than setting your house on fire because you are a tiny bit cold. After ten long years of steadily rising equity markets, or ��markets�� as we like to call them to denote their fictitious and often fraudulent nature, something approximating volatility has returned here very late in 2018. As we head into 2019, we�re expecting to see a lot more volatility and even more losses as reality once again steps back into vogue. It never really left, of course, only was kept away for a while with monetary Botox administered by self-delusional bankers and politicians unable to face their many failures directly. This is why the �recovery� is not really a recovery. It�s not based on anything organic or healthy. It�s simply borrowed and all borrowing sprees eventually come to an end. The above chart is a head scratcher. 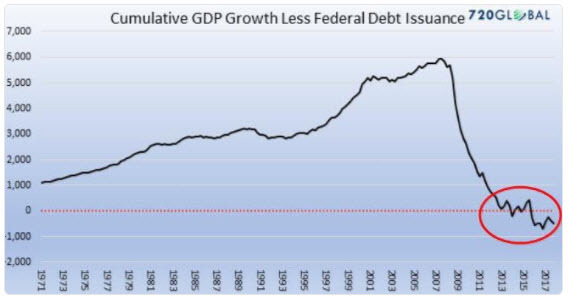 Whenever that line is moving upwards, it means that debt growth is outpacing economic growth (and remember, debt�s effect on GDP is not factored out, so it�s even worse than what you are seeing here). What�s the plan here? 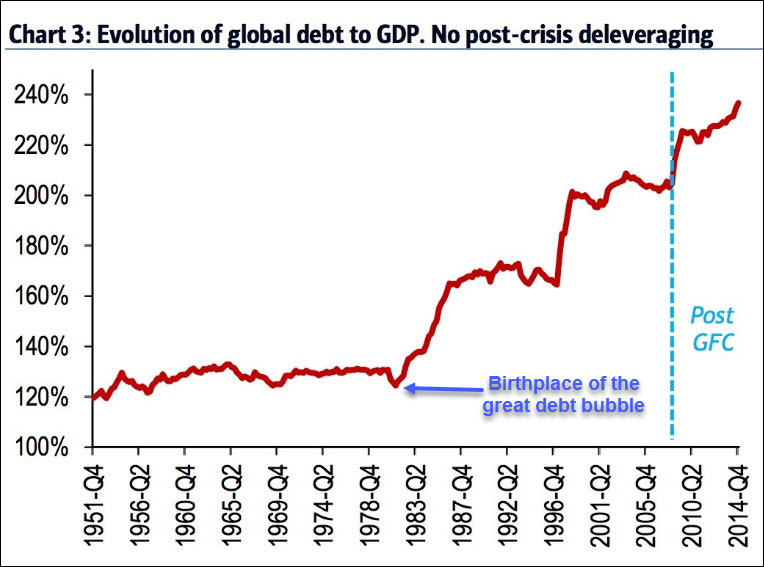 Continue to pile up debt at a faster pace than economic growth forever? What about the idea that economic growth has slowed of late and cannot grow forever for resource related reasons? Is anybody in power paying even the slightest bit of attention? Until and unless the central banks do something very, very different in the months ahead, it�s over. But one thing we could immediately do is realize that whatever it is that we�ve been doing over the past 25 years that�s new should be stopped right away. So even if the central banks fold and �win the battle� by getting stocks and bonds to resume their march higher, they will assure that we �lose the war� by distracting the center mass of humanity with dreams of riches that will serve to deflect attention from the many predicaments that we face. That�s one of my favorite sayings; I might be wrong, but I�m not confused. We�re as certain as can be that the insects and oceanic plankton are sending very important signals to those who can see them. We know that one cannot borrow more than one earns forever. We know that steep and rising wealth and income gaps are socially destabilizing. We know that there�s a future energy crisis coming for which the world is utterly unprepared along every dimension including transportation and food production. We�re not even the slightest bit confused about any of that. Losing hope is a great first step. We don�t need any more hope. We do need optimism and we do need new actions, which means we need new belief systems and, of course, all new narratives. Once we accept where we are and the path we�re on, then we can begin the long process of building resilience into our lives and communities. Step 1: Make sure your wealth is safely managed or entirely out of the markets. Our endorsed financial advisor uses a variety of hedging techniques to manage risk on existing positions to both limit downside as well as generate some additional returns. Keeping money in cash in the system to us means using TreasuryDirect in part to keep your cash in the safest of all possible places � with the US Treasury. If the Treasury fails, well, then we all have much bigger problems to contend with. To move beyond the basics, and to meet your fellow tribe, consider coming to this year�s Peak Prosperity seminar to be held April 26th � 28th in Sebastopol CA (link to more information here). Between here and there? A world of pain as expectations are forced back down to reality. 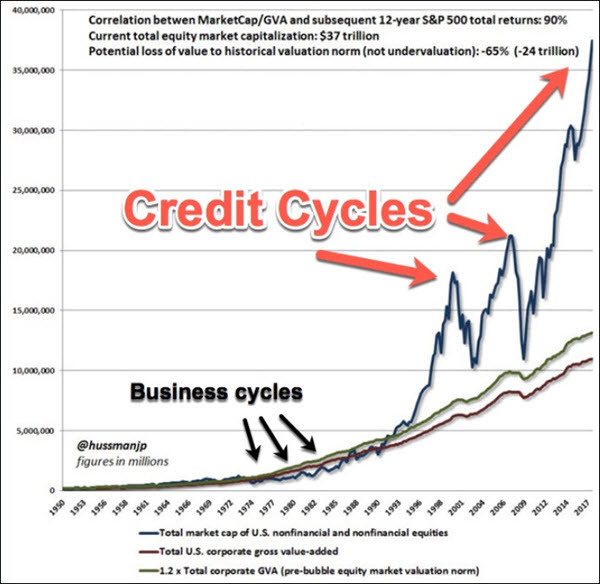 If we�re lucky that happens over many decades in a fairly predictable glide path. If we�re not lucky, then it happens rather suddenly, or in a series of short, sharp shocks like a bowling ball falling down a set of stairs. That could be a war in the middle east that drives the price of oil over $300/barrel, or a gigantic financial crisis that closes financial borders and causes one or more currencies to utterly fail (I�m looking at you Japan! ).